The “A Tribute to Jimmie Angel” expedition to Angel Falls is arranged by Angel-Eco Tours and co-lead by Angel-Eco’s President, Paul Stanley and Karen Angel, niece of Jimmie Angel and President of the Jimmie Angel Historical Project (JAHP). Ms. Angel will share her knowledge about Jimmie Angel and Ruth Robertson as we follow Robertson’s route all the way to Angel Falls. Carlos A. Freeman photographed Angel Falls from Jimmie Angel’s Hamilton airplane 1 May 1939. It and a companion photo of Angel Falls were the first published photographs of the waterfall appearing in “Exploración de la Gran Sabana,” Revista de Fomento, No. 19, December 1939. Freeman was a Venezuelan mining engineer and one of four leaders of the Venezuelan Ministry of Development’s 1939 Gran Sabana Expedition. Jimmie Angel was the pilot-guide for the expedition which worked in the field for five months. 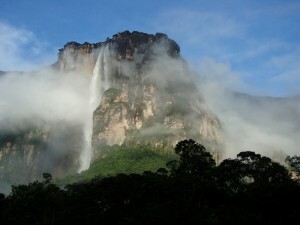 The first base camp for the expedition was near the Pemón village of Kamarata which is located in Canaima National Park. 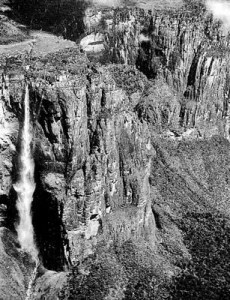 The waterfall was officially named Salto Angel (Angel Falls) in December 1939 by the Venezuelan government in honor of Jimmie Angel’s exploration of the Gran Sabana during the years 1933-1939. His ashes were scattered over the waterfall 2 July 1960. Churún Vena is the indigenous Kamarata Valley Pemón’s name for the waterfall. Churún Merú is their name for the lower portion of the waterfall. The Spanish Salto Angel translates to Angel Falls. For many years Ruth Robertson’s Expedition was mostly overlooked in official chronicles of the history of Angel Falls, but contemporary writers Karen Angel, documentary filmmaker Isabel Barton and entomologist Jorge González. Ph.D. are helping through their writings and filmmaking to make the public aware of her contributions to exploration. Mr. Stanley will share his experiences as President of Angel Conservation, an organization he founded to work with and preserve the culture of the indigenous Kamarata Valley Pemón and the flora and fauna that gives them life. About Our Trip to Angel Falls: This trip is, in part, a fund raising benefit for the Jimmie Angel Historical Project (JAHP), a 501(c)(3) organization incorporated in California, EIN: 68-0372407. Ruth Robertson’s epic expedition started in Caracas on 23 April 1949; she reached Angel Falls on May 11th and Mayupa Rapids on May 17th. Our expedition will take only eight days!